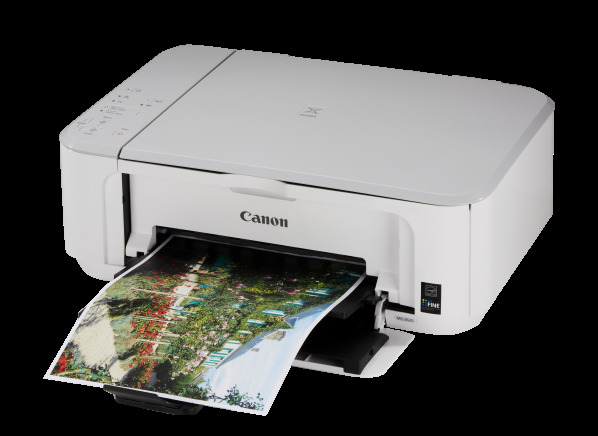 An all-in-one inkjet printer from Canon, with scan and copy functions, WiFi networking, and wireless printing with Apple AirPrint and Google Cloud Print. Works with Windows and macOS. The Canon Pixma MG3620 is an all-in-one inkjet printer with scan and copy functions. It works with Windows and macOS. The multi-color ink cartridge must be replaced when a single color runs out. The printer has no display screen. It has Wireless PictBridge for direct printing from portable devices that have this feature. You can connect directly to a PC with a USB cable, or to your network router wirelessly with WiFi. When setup for use, the Canon Pixma MG3620 requires a space that measures 6.1 inches high by 17.6 inches wide by 22.7 inches deep. Networking Networking The printer may connect to a home network either via an Ethernet or a WiFi connection. Ethernet is the common wired network and WiFi is the wireless format commonly found in laptop computers. Many printers also support Apple AirPrint and/or Google Cloud Print. WiFi Auto-connect WiFi Auto-connect An installation feature that links a printer to a home network by copying the settings from a computer that is already linked to the same network. Avoids typing passkeys and pressing WPS buttons. WiFi Direct WiFi Direct Provides a wireless connection for local printing from a mobile device like a smartphone, even if the printer and smartphone are not joined to a home network. PictBridge PictBridge This feature allows direct printing (without the use of a computer) from any brand of digital camera to any brand of printer. It relies on a USB connection. More recently, Wireless PictBridge has appeared on some models. Built-in fax Built-in fax For an all-in-one printer, a built-in fax modem that lets you fax what you've scanned without the need for assistance from the computer's own communication hardware. Individual color tanks Individual color tanks Some inkjet printers use a separate tank for each color. Others have tri-color cartridges with three colors in one. Individual tanks let you replace only the color that runs out rather than tossing a tri-color cartridge that may have some ink left. Auto-duplex printing Auto-duplex printing Can print automatically on both sides of the paper. Automatic document feeder Automatic document feeder Lets you automatically load multiple-page documents into an all-in-one printer for scanning or copying. Auto-duplex scanning Auto-duplex scanning Can scan and copy automatically both sides of the original document. Flatbed design for scanning and copying Flatbed design for scanning and copying Most all-in-one printers have a glass scanning bed with a lid you can fully raise in order to scan books and other thick media as well as flat originals. Items scanned can also be faxed. But some models, usually portables, use a sheet-fed scanner which is trickier to use. Can print if color empty Can print if color empty Can still print (usually in black and white only) if a color ink cartridge runs out. May require changing a setting, and leaving the empty cartridges installed. The printer may offer this option for a short time only. The option may not appear at all unless you've first installed the printer's full software package. Swap black for photo ink Swap black for photo ink The photo ink for some inkjet printers comes in an extra cartridge. To use these photo inks, you must remove the black-ink cartridge and replace it with the photo-ink cartridge. To go back to printing text or graphics, you must do the reverse. This can get tedious. Models that hold all the inks simultaneously minimize the hassle. LCD viewer LCD viewer Printer has a built-in LCD screen for viewing and editing images from a memory card. The screen is small, usually only 1 to 3.5 inches, and editing capability is very limited. Borderless photos Borderless photos This feature lets you print photos that go edge-to-edge without a white border. Memory-card reader Memory-card reader Indicates whether the printer has a built-in memory-card reader. If so, this feature lets you print image files from a digital camera's memory card without using a computer. You can also transfer the files to a computer. Product type Product type Models are directed at specific segments of the consumer market. The SOHO or Small Office-Home Office type model is intended for higher-volume printing than the Personal type. Printing method Printing method Indicates which technology a printer uses to create an image onto paper or other media. Most printers use inkjet technology, printers intended primarily for text use laser technology. Standard-sheet capacity Standard-sheet capacity How many sheets of standard-thickness (20-lb.) paper can be stored in the printer's input tray. Height (in.) Height Measured in inches, the height of printer when it is open and ready to use, with trays extended and paper in trays. Width (in.) Width Measured in inches, the width of the printer when it is open and ready to print with paper loaded. Depth (in.) Depth Measured in inches, the depth of printer when it is open and ready to use, trays extended and paper in trays, and allowing for rear connectors. Text speed (ppm) Text speed (ppm) Our measure of how fast the printer can print pages of monochrome text. Ink cost/month ($) Ink cost/month Estimated cost (in dollars) for ink or toner in a month of typical use, based on our tests and how our readers told us they print. For inkjets: 23 text pages, 9 graphics pages, 2.4 large photos, 3.6 small photos, and 3.5 photos on plain paper. For lasers: 62 text pages, 24 graphics pages, 1.7 large photos, 1.9 small photos, and 2.3 photos on plain paper. Photos cost the most, text documents the least, so your results may vary from these figures, but they are useful for comparing models. Text cost (cents) Text cost The ink-related cost of one page of black text. Graphics cost (cents) Graphics cost The cost of printing one page of a colorful chart or web page, in cents. 4x6 photo cost ($) 4x6 photo cost 4x6 photo cost per print. 8x10 photo cost ($) 8x10 photo cost 8x10 photo cost per print. Maximum paper size Maximum paper size The maximum size paper which the printer can accept for printing. Maximum paper basis-weight Maximum paper basis-weight All printers can accept standard-thickness/stiffness paper, referred to as 20-lb. basis weight. But many accept thicker/stiffer paper. The basis weight actually corresponds to paper density, which affects thickness and stiffness. Platform Platform Which operating system(s) will support a given printer. Most printers can work with both Windows and the Macintosh, although models differ on which versions they require. Number of cartridges Number of cartridges The number of cartridges or tanks of ink or toner that the printer requires. Some printers which promote photo-printing may use more than 4 cartridges.